Bottom Strapped Multi Toned Tote Bag. Ideal for Several Occasions. Boat Shaped for Style and Convenience to Hold All Your Essentials. Bottom Studded Tote Bag with Top Handle for Firm Grip. Ideal for Several Occasions. Square Sized for Style and Convenience to Hold All Your Essentials. 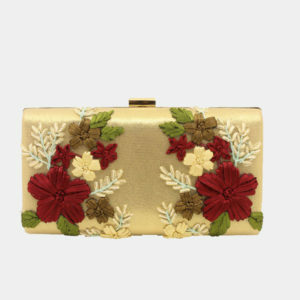 Double Bouquet-Embroidered Clutch with Golden Clasp. Ideal for Several Occasions. Sized and Shaped for Elegance and Convenience to Hold All Your Essentials. 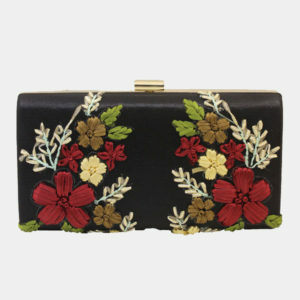 Ladies Clutch with Brocade Patterned Flower and Golden Clasp. Elegantly Sized and Shaped for Convenience to Hold All Your Essentials. Buckle Centered Tote Bag with Shoulder Straps. Ideal for Several Occasions. Shaped for Style and Convenience to Hold All Your Essentials.